Welcome. Education plays a vital role in fish and wildlife conservation. We are proud to provide a wealth of information and educational resources on a wide range of conservation and outdoor topics. Whether you are a hunter, angler, teacher, parent or an aspiring outdoors person, we have resources to help. Search the main categories to learn about our many offerings including workshops for teachers, educational and informational materials, camps and skills clinics for youth and adults, and much more. You can also browse our calendar to find dates of courses, camps, clinics and other community events. We offer educational resources for all ages, from early childhood to adults. Anchorage — April 28, Sunday 9am–6pm. The Alaska Wildlife Curriculum Ecology Cards contain line drawings and facts about more than 200 Alaska plant and wildlife species. Resources, classroom programs, curricula and teacher workshops. 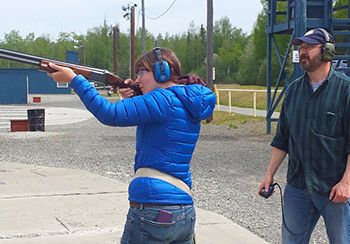 Hunter education courses, state shooting ranges and more. Rod loaner program and how to set line for burbot. Youth camps, Becoming an Outdoors Woman and skills clinics for youth and adults. Fun learning opportunities for all ages!